So where do youth-led priorities stand at this point in session?! Ending use of jail for non-criminal behavior- SB 5290 has been pulled from the Rules Committee and is awaiting a vote in the Senate. 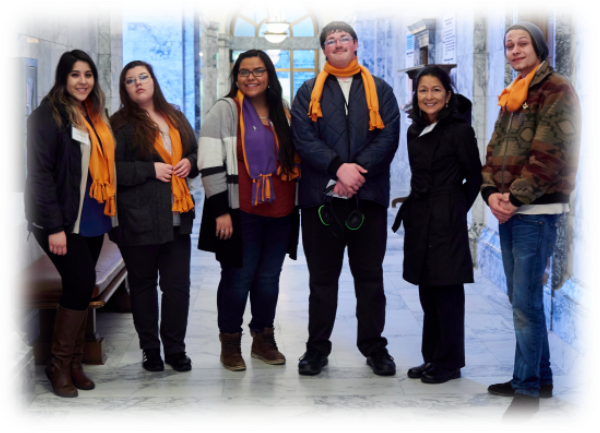 Adding two young people to the DCYF Oversight Board - Both SB 5435 and HB 1651 have been voted out of their chambers well ahead of the deadline! The two bills differ slightly but both add two young people – one with child welfare system experience and one with juvenile justice system experience. Adding two young people to the OHY Advisory Committee - HB 1657, which would add two youth and make important technical changes to OHY programs, passed out of the House last Friday! Budget priorities - Lawmakers will begin turning their attention to the budget this month, and we expect proposals out by the end of March. Currently, they are grappling with a $3 billion deficit, caused by a combination of rising costs, obligations from lawsuits and collective bargaining agreements, and an insufficient revenue system. We will keep you posted about advocacy opportunities. Young people of color are overrepresented in foster care, among youth and young adults experiencing homelessness, and in our juvenile justice system. We acknowledge this disproportionality and seek solutions that eliminate those disparities and promote well-being for each and every child and young person. End practice of jailing minors for truancy, running from foster care placement, or violating ARY/CHINS petitions. Replace with trauma-informed processes that address root causes and promote safety and well-being. Designate two seats on DCYF Oversight Board for young adults with lived experiences of child welfare and/or Juvenile Rehabilitation Administration. Designate two seats on OHY Advisory Committee for young adults with lived experience of homelessness. Begin transition planning for youth in foster care at age 14 by establishing dedicated staff to facilitate/support planning and coordinating with Independent Living Services (ILS) (Budget only). Expand school points of contact for students experiencing homelessness; encourage school housing partnerships to address racial disporportionality among homeless students; and expand finding. Invest $4 million per biennium to support four Washington communities (Pierce County, Walla Walla, Yakima, and Spokane) as they build a system to end youth homelessness by 2022.